Last night's fire is not being treated as suspicious, the Worthing fire station manager has confirmed while thanking the community for their support. The fire service spent six hours putting out the blaze in the block of ten flats above five shops in Rectory Road, Worthing, having been called to the scene around 6.40pm. Roy Barraclough, Worthing fire station manager, was one of the first people at the scene. He confirmed the fire began in the flat above the Gurkha Tandoori restaurant and as it was a 'rapidly developing situation', he asked for additional manpower and engines to be called to the scene. He said: "This is one of the most serious fires I've been to in my career; sending out ten fire engines doesn't happen that often thankfully." The road was closed, and at about 11pm part of the building collapsed above Thomas Food and Wine. At the peak of their response, 50 firefighters were putting out the fire. By midnight, the blaze was under control. He said there were several factors which made it so 'severe and challenging': "It is a very old structure, and it is in the roof so it is difficult to get access. The challenging thing was to make sure it didn't spread and everyone worked very hard to make sure that didn't happen. "It is pretty devastating for everyone involved; a lot of people have walked out with just the clothes on their backs. But it is fantastic that no-one has been seriously hurt, that is the number one thing - everything else can be rebuilt. I'm sure the community response has been a real comfort for these people as well." Fire crews remained on the scene during the night, and investigations began this morning. 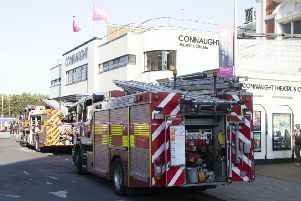 While the cause of the fire is still unclear, Mr Barraclough said they were not treating it as suspicious at this stage. There have also been surveys carried out today on the buildings to see if they are structurally sound or not, with a view to residents being able to go back inside to collect belongings soon. This is being co-ordinated by Worthing Borough Council. Mr Barraclough said they hoped to open the southbound lane of Rectory Road today, but the northbound lane will likely remain closed. The community has praised the fire service for their hard work. In response, he said: "The guys do work hard at these incidents and you don't put a fire out without people putting themselves at risk so to be appreciated is really great." The Thomas A Becket pub has been inundated with clothes, blankets and other goods since last night, and now asking for no more donations. Meanwhile, a spokesman for Worthing Borough Council said they were helping 16 people who had been unable to return to their homes due to the fire, including finding emergency accommodation for several of them.